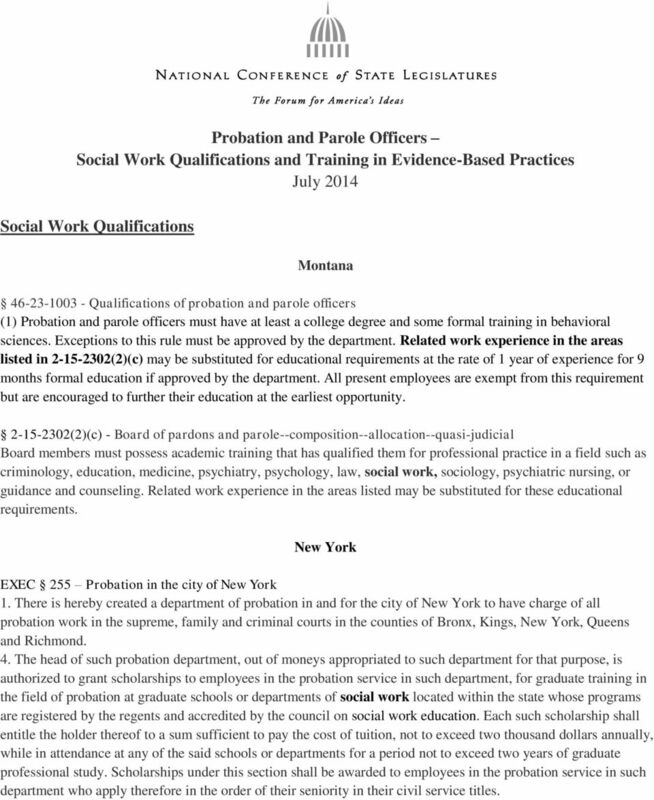 Download "Probation and Parole Officers Social Work Qualifications and Training in Evidence-Based Practices July 2014"
1 Probation and Parole Officers Social Work Qualifications and Training in Evidence-Based Practices July 2014 Social Work Qualifications Montana Qualifications of probation and parole officers (1) Probation and parole officers must have at least a college degree and some formal training in behavioral sciences. Exceptions to this rule must be approved by the department. Related work experience in the areas listed in (2)(c) may be substituted for educational requirements at the rate of 1 year of experience for 9 months formal education if approved by the department. 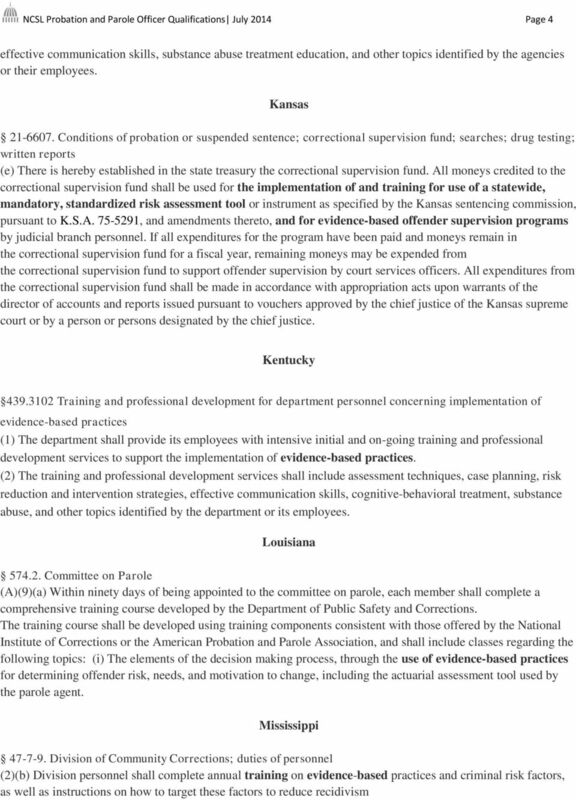 All present employees are exempt from this requirement but are encouraged to further their education at the earliest opportunity (2)(c) - Board of pardons and parole--composition--allocation--quasi-judicial Board members must possess academic training that has qualified them for professional practice in a field such as criminology, education, medicine, psychiatry, psychology, law, social work, sociology, psychiatric nursing, or guidance and counseling. 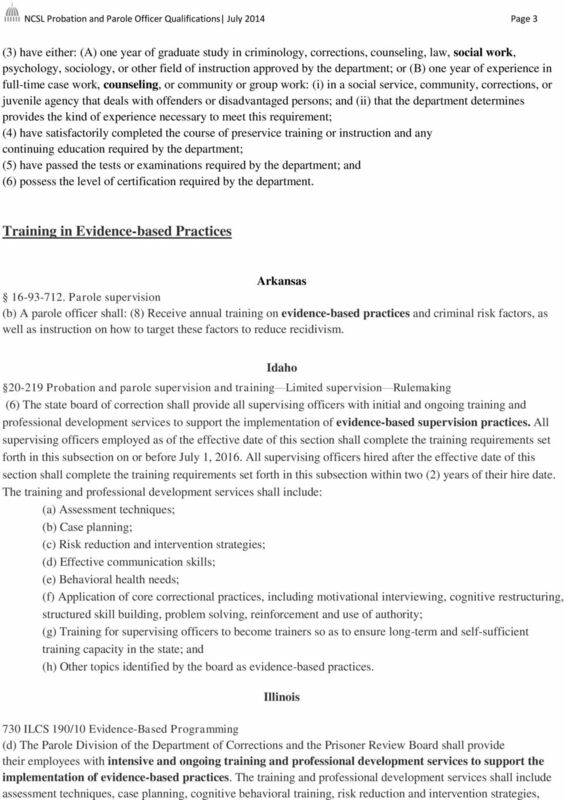 Related work experience in the areas listed may be substituted for these educational requirements. 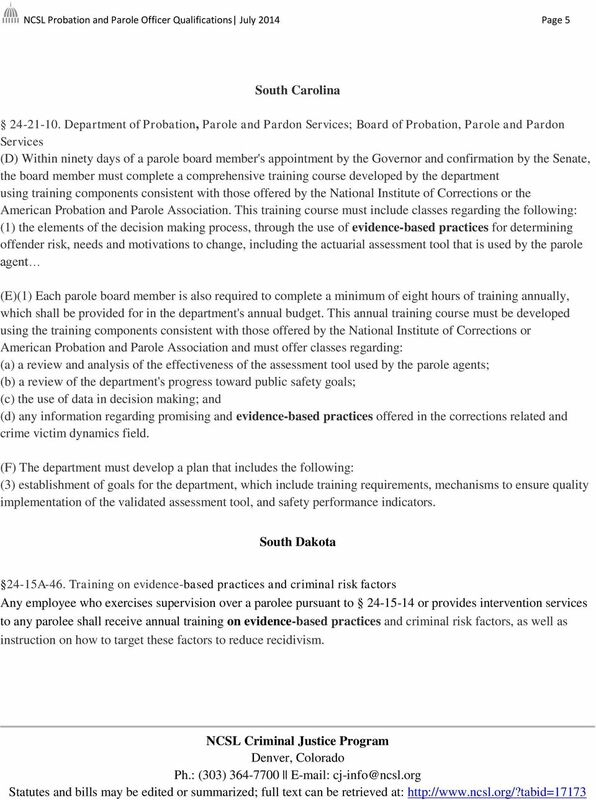 New York EXEC 255 Probation in the city of New York 1. There is hereby created a department of probation in and for the city of New York to have charge of all probation work in the supreme, family and criminal courts in the counties of Bronx, Kings, New York, Queens and Richmond. 4. 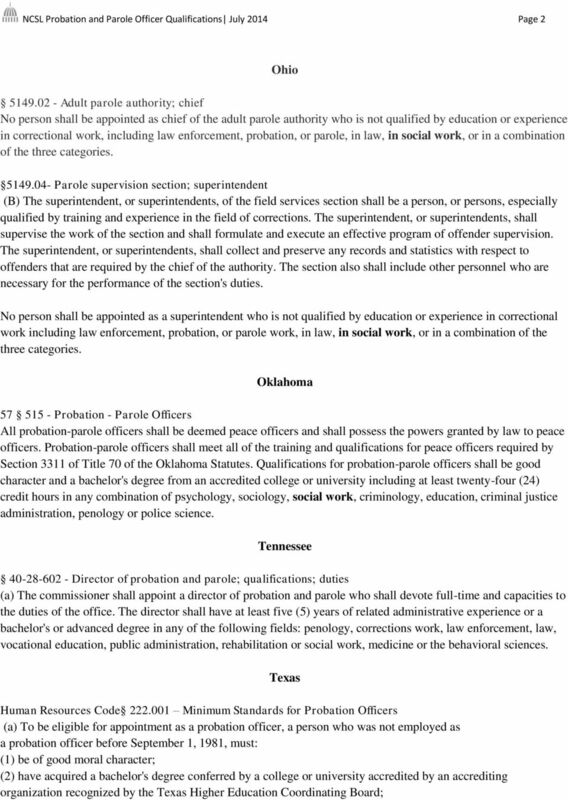 The head of such probation department, out of moneys appropriated to such department for that purpose, is authorized to grant scholarships to employees in the probation service in such department, for graduate training in the field of probation at graduate schools or departments of social work located within the state whose programs are registered by the regents and accredited by the council on social work education. Each such scholarship shall entitle the holder thereof to a sum sufficient to pay the cost of tuition, not to exceed two thousand dollars annually, while in attendance at any of the said schools or departments for a period not to exceed two years of graduate professional study. Scholarships under this section shall be awarded to employees in the probation service in such department who apply therefore in the order of their seniority in their civil service titles.